This Beef Chow Mein is cooked using Premium Egg noodles stir-fried with slices of fresh green cabbage, slices of fresh celery, fresh bean sprouts, fresh Chinese baby bok choy, and slices of fresh carrots, with fresh slices Certified Angus Beef, all cooked in an Extra large stationary wok with premium sauces at temperatures up to 500°F rounds out this Chinese icon. Due to popular demand, regular patrons like to add extra Certified Angus Beef to this dish. 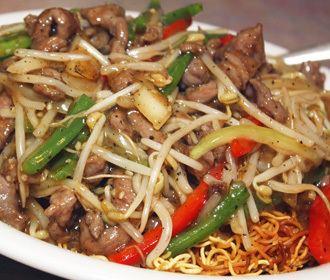 As more meat is added, the Chef also throws in extra noodles. An Extra Kicker adds a slightly little extra meat. Choosing "Let it Ride" adds a level 2 additional amount of Certified Angus Beef. By opting for "Double Down" the Chef literally doubles the amount of Certified Angus Beef he puts in on a regular dish, as well as throwing in additional noodles.